A stone axe-head and Roman and Anglo-Saxon coins were reportedly found here in Victorian times. Local historians of the same period claimed to have found a Roman road and an Anglian forge here but there is now some debate about these. The first real record of life in Royton occurs in a tax document of 1212. In it one William Fitz William owned 12 oxgangs of land in Ruhwinton. Later forms of the township name are spelt as Ruyton, Ritton, and Ryton. It has been suggested that the Rye crop gave the town its name, Ryton meaning Rye Farm and Ryley (modern Royley) meaning Rye Clearing. There is still some debate about this. William Fitz Willliam’s grand-daughter, Margery Lutterel, sold part of the township to the Byrons of Clayton Hall in the 13th century but retained a proprietorial interest in the manor until the 15th century . In the 14th century two Byron Brothers shared 4 ‘messuages’ or farms, plus farmland but it is not known how many other families lived in the township, or whether Royton Hall was one of these messuages. Seven Freeholders are listed on the subsidy roll of 1332. At this time Royton seems to have been a collection of isolated cottages around the edge of the Byron lands. There is evidence for common grazing land at Cowgates (between Heyside and Dogford) and of a pinfold or pen for stray cattle at Luzley Brook. Tenants would seem to have got the turf for their fires via the Turf Lane leading to Royton Moss by Heyside. By the 16th century there is evidence of a park at Royton Hall, although there is reference to a ‘Park of Lyme’ in Royton before this time. This may have been originally enclosed for deer hunting, but it was also used as a paddock. Sir John Byron, Deputy Lieutenant of Lancashire, resided at the hall during the Armada crisis, and conducted government business from the hall. He is said to have rebuilt and extended much of the old medieval hall. In 1622 the Byrons sold Royton to Sir Ralph Standish of Standish , who owned a third of Chadderton Manor. By this time the Byrons had enclosed, improved and leased or sold much common waste land. The future great landowners, the Holdens of Holden Fold, the Cheethams of Heyside, the Tetlows of Royley, and the Taylors of Thorpe, had begun to flourish. The Byrons had however fallen afoul of their Oldham neighbours by claiming land for coal mines on a disputed part of Oldham Edge. A later Sir John Byron, a Royalist general in the Civil War , was declared to be among the seven most dangerous men in the Commonwealth, and subsequent romantic folklore attributed to him the origin of Royton’s present nickname : ‘The Royton Seven’ or ‘One of the Seven’. In 1622 Royton Hall and manor were purchased from the Byrons by the Standish family, already owners of a third of Chadderton. The manor then included Royton Hall gardens and park, the corn mill at Stove, and most of the centre and east of the township. In 1662 the Standishes sold Royton and their part of Chadderton to the Percivals, originally linen merchants of Manchester and Liverpool. This was significant as linen weaving was a growth industry and many local farmers were already supplementing their income by weaving wool and flax. During the 18th century cotton, mainly imported from the southern United States, overtook linen and wool to become the staple industry, and agriculture declined. In 1758, the cost of imported corn caused riots in Manchester and the surrounding area and Thomas Percival of Royton Hall, a magistrate, was forced to call out the troops to restore order. However, he also defended his weaver tenants who complained about the high food prices. As a sign of the times Royton’s corn mill was converted to a wool fulling mill by the Whitworth family in the middle of the century and the various cottage hamlets in the township began to grow with the influx of immigrants seeking weaving work. During this time Thomas Percival completely rebuilt the front and west wing of Royton Hall and encouraged the spread of a village nearby. In 1754 he donated land at the north-west end of the village for a chapel and when St Paul’s was completed the villagers no longer had to walk to Oldham or Shaw for Divine worship. Thomas Percival’s daughter Katherine married Joseph Pickford of Ashton Under Lyne. Her son, William Pickford, succeeded after her death but Joseph Pickford acted as squire and magistrate in Royton. During the Pickford’s squirearchy Royton had become known for its dame schools and self-educated men. Political clubs and a botanical society flourished and debate was rife. At the outbreak of war with Revolutionary France, and during a corn shortage, a local reform club convened a public meeting (supposedly in favour of French revolutionary principles) which was broken up by a Royalist mob and army recruits from Oldham in 1794. This became known as the Royton Races. Afterwards, Roytoners visiting Oldham were sometimes pelted with stones and were denounced as ‘Jacobins’ and ‘One o’t Seven’. Royton became notorious as a radical town. By the 1790s the first waterwheel - powered cotton mills were being built in Royton, at Holden Fold, Thorp Clough, Stove, Bank, Shilo, Elly Clough and Dogford. These were operated by the Taylor, Lees, Holden and Travis families. Other mills utilising horse-driven machinery were also built in Royton Village. These spinning mills produced ever more yarn for the growing cottage weaving industry and the population of Royton continued to expand. After 1800 the village began to spread out down Sandy Lane with regular streets built at right angles to the road. In 1795 Joseph Pickford inherited his uncle’s property and surname of Radcliffe. He moved to Mills Bridge near Huddersfield and leased Royton Hall to various tenants, including his son-in-law Joseph Starkie or Starkey, High Sheriff of Lancashire, and the Rev. Joseph Hordern, of Shaw Chapel, who ran the hall as an upper class boarding school until 1815. To prove that not all the old ways were passing completely, during the food shortages of that period the Andrew family built a windmill near Edge Lane Hollow for the grinding of corn. This was to be the first and only windmill in Royton. The introduction of Steam power in the 19th century increased production and transformed local cotton mills. It also put the old cottage weavers out of work. There was a depression in the 1820s with many Royton folk on poor relief. The subsequent years from the 1830s to the 1860s did not see a large industrial or population growth. During the first part of the century Royton had many political meeting rooms. In 1819 Royton radicals sent a large delegation to the ill-fated ‘Peterloo’ meeting in Manchester to promote parliamentary and agricultural reform. They suffered several casualties in the ensuing ‘massacre’. Both the Middleton and Royton radicals partook in military parading on Tandle Hill at this time, summoned by Tom Bluet’s bugle. (The name of our Society's newsletter ‘The Bugle’ reminds us of these exciting days). The radicals had many ex army and militia men in their ranks after the disbanding of the wartime armies in 1815. This alarmed the authorities and a legend arose that the beech plantation now covering much of Tandle Hill was originally designed to prevent ‘revolutionary meetings’ and the military-style drilling of disaffected men. It was said that whenever the Oldham Volunteer Militia marched through Royton the inhabitants shut their doors and shuttered their windows in protest. William Fitton of Royton was a noted inflammatory orator and political leader at this time. In the 1820s James Taylor, William Fitton’s cousin, taught himself to read and write poetry. His parents had kept him illiterate lest he turn out a radical politician like his cousin and uncles. He eventually gained fame as the Royton Poet and his best known work is ‘On My Native Village’. His contemporary, John Mellor also gained fame as a botanist and founder of Royton Botanical Society. Thanks to the generosity of his landlord George Booth, and other gentlemen, he was able to travel the country collecting specimens. The old town gardens lay to the west of St Paul’s on the site of the present Church Street. This street was originally called Garden Road and was much loved by evening strollers. In the 1830s the present Rochdale Road was completed to connect Rochdale and Oldham. It divided the old Royton Hall Park and became the new main road of the town. Royton Hall was occupied by the cotton mill owner and farmer John Wild, followed by The Fittons, and then the Travis family, who used the back of the hall as a farm while subletting the main building to paying tenants. By the 1870s most of the western side of the park had been covered in housing and farming at the hall had ceased. In the meantime the chapel of St Paul’s was extended and a courthouse built. In the 1860s a branch line, railway station and cotton warehouse were built on the site of the old hall tree-nursery, off High Barn Street. A Local Board of Health was formed in the 1860s to replace Parish officers, with elected councillors - mainly Liberals. Conservative opponents called them the Royton Heptarchy. There soon developed a rivalry between Radical Royton and neighbouring ‘Tory’ Shaw. During the course of the century Royton Wakes, held during the first week in August, became an annual holiday when the mills closed for maintenance. Wakes was the time for parading rushcarts and one of the last of these went out from the newly built Duke of Edinburgh in Market Street during the ‘60s. Another used to be built at Fir Lane. From the 1870s Royton Gala Sports were held at the Paddock every Wakes with a top prize of the Pickford and Royton Hall Plates. A secondary holiday became fixed on the fourth Sunday in Lent (Mothering Sunday), when stalls would be set up to exhibit simnel cakes and other wares as a counterbalance to the Lenten fast. The founder was said to be a farmer and bread baker who came to Royton from Bury, then famous for its simnel cakes, in the 1790s. Mid Lent soon became known as the ‘Royton Rant’ because of its boisterousness. With the growth in co-op societies in the 1860s, the share-owning principal took hold and in 1871, as the cotton trade began to pick up, the first ‘co-operative mill’ was built on the site of the old dog kennels of Royton Hall off High Barn street. This was Royton Spinning Mill and was the first of over a dozen shareholder - financed mills to be built in the next 30 years. As these were all spinning mills only, weaving declined, but the population of Royton doubled from 7,000 to over 14,000 , with the housebuilders hardly able to keep up with demand. 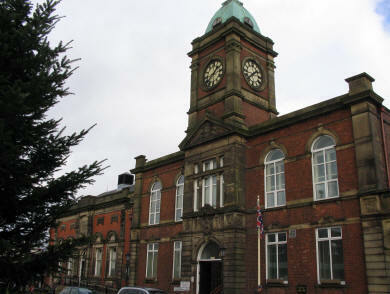 By the 1890s Royton had become an Urban District Council based at the new Town Hall in Rochdale Road. A new market hall next door replaced the old market held at Croft Head. Two new churches were built to supplement the growing number of nonconformist chapels. St Paul’s was completely rebuilt and SS Aidan and Oswald’s was erected to serve the needs of the Roman Catholic inhabitants, mainly Irish immigrants who flocked to the new mills. The absentee lords of the manor, the Radcliffes, had themselves converted to Roman Catholicism by this time and they donated both land and money for the building of the new church. Even at the height of its industrial expansion Royton had not been forgotten by its manorial squires. At the beginning of the 20th century Royton was completely tied to the cotton trade and its supporting engineering and coal industries. During the steady population increases of the 19th century old village ways had begun to give way to industrial urban ones, yet the town retained much of its old village character. Between 1901 and 1914 five splendid new Accrington brick mills were built - The Fir, Roy, Park No.2, Park and Sandy and Royton Ring Mill, drawing in new workers and increasing the population to over 17,000. Gradually most of Royton's mills were formed into two major competing groups controlled by the two ‘Cotton Kings’, the Gartside and the Cheetham families and associates. Despite this further population increase new house-building was falling behind the population growth and Royton became a crowded town with many of the older village houses being rented out as upper, lower, and cellar tenements. The old 18th century village by Croft Head was becoming shabby and dilapidated. In order to give the town some open space the council purchased the site of the old Royton Coal Pit, which closed in 1901 and was the last open land within the old Hall Park, for a municipal park (Royton Park). This opened in 1911, just before the outbreak of war. After the Great War the Cotton industry went into decline due to competition mainly from India, which had imported Lancashire machinery and had the advantage of cheap labour and accessible cotton fields. Production and population growth ceased for the first time in a hundred years of steady growth, but it took a long time for Roytonians to grasp the fact that the Lancashire cotton trade was in long-term decline. Three thousand former cotton workers left Royton and the town became run-down. It was not until the 1960s that investment in new housing and the growth of light industries began to bring immigrants once more into the town. The population in 2001 was 21,000. Many new incomers were from the Manchester area or from Oldham, which has lost a third of its population since the Great War. In 1912 the 18th century mining cottages of Edge Lane were demolished, eventually to make way (after the war) for the new Broadway arterial road and the building of St Ann’s Church and school. In the 1930s much of the old 18th century village at Croft Head was demolished to make Jubilee Gardens, and in the 1960s and 70’s the gardens were again built on in their turn, by a housing association. After the Great War new housing estates had been built at Oozewood, Haggate and Birchinlee. In 1939 Royton Hall, after years of neglect and varying tenancies was declared unsafe and finally demolished. In the 1960s most of the old village at Sandy Lane and Market Street was cleared en masse to create the new housing at Holly estate and the shopping precinct. The after-effects of industrial pollution and neglect were stark and carried away much of Royton’s architectural history as well. Many old ways were disappearing. However despite the times the local Morris dance team, led by James Coleman and the McDermott family in the 1890s and up to the outbreak of the Great War, was revived by the English Folk Dance Society in 1929. In 1935 they won ‘the All England Championship’ at the Royal Albert Hall. They were revived several times afterwards before being disbanded in 1983. Royton had been enlarged by incorporating part of Thornham in 1894. The Tandle Hill Park area of Thornham was purchased from the owners by Norris Bradbury, manager of the King Mill, and donated to the people of Royton as a public park in 1919. And Oldham Edge today (mostly within the Royton boundary), after a brief use for tank training, has now reverted to public open space, albeit steadily encroached by new housing on the Oldham border. In the 1980s a new industrial park was built on the area of old Salmonfields Farm in Royton, further encroaching on green space. During all this time Oldham’s greater growth in size prompted attempts to take over Royton and Chadderton but this was successfully opposed by Lancashire County Council, which was loath to lose two prosperous towns. Oldham’s empire building was not to go away however and as a result of the Radcliff Maude local government reforms of 1974, a reviving Royton lost its independence, becoming part of the new Oldham Metropolitan Borough, an amalgamation of seven local authorities whose total area was also declining in population. This spurred a latent patriotic feeling which saw the creation of a charity group called ‘The Royton Seven’ which raised money for worthy causes ‘within the bounds of Royton’. The revival of the Royton Morris Dancers between 1978 and 1982 was another manifestation of community spirit. However both these groups have since disbanded. The outgoing council built Royton Assembly Hall ‘as a gift to the people of Royton’ before disbanding itself. Alas this was sold by the new OMBC to a private developer which (at time of writing) seems to have run out of money to finish renovations. The developer has renamed it Royton Hall. Royton Local History Society was formed in 2002 to further the interests of Royton and its heritage. The Society created the ‘Royton Lives Through the Ages’ project to oversee archaeological digs on the site of Royton Hall in 2005, 2006 and 2007. This was deemed a major historical event by the University of Manchester Archaeological Unit and, it is hoped, has highlighted the importance of Royton in Lancashire history.